Happy Independence Day one day early! 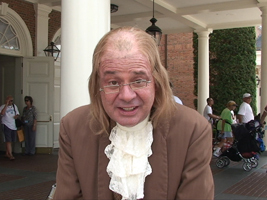 We are looking forward to enjoying part of our 4th of July holiday at Walt Disney World again, including with Ben Franklin at Epcot. This has been a Independence day tradition for us for the last 3 years and he never disappoints (below, left). He removed his hat while we recorded a fun greeting (below, right). We especially love this mention of the “Captain of the Americas”! Shot from Disney’s Polynesian Resort Beach for a complete view of the fireworks, this patriotic arrangement of pyrotechnics has delighted audiences on Independence Day since the show debuted in 2008. With stars bursting in the sky above the brightly lit American flags of Disney’s Electrical Water Pageant, it’s hard not to get a lump in your throat during the awe-inspiring finale! 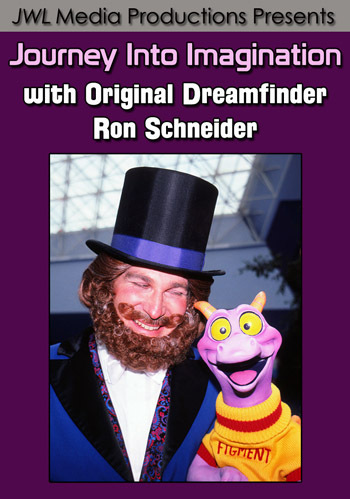 Celebrate 40 years of Walt Disney World with this special viewing of Wishes! Jiminy Cricket and the Blue Fairy narrate this classic spectacle, and you’ll enjoy it from three different angles. 180 degree fireworks help create a dazzling tribute to Walt Disney World’s 40th Anniversary that you’ll cherish forever! A favorite of guests since it debuted in 1999, Illuminations: Reflections of Earth is an achievement in both sight and sound. 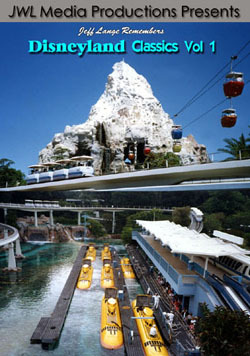 Pyrotechnics light up the night sky, and you’ll practically feel the heat off the burning barge! The show tells the story of Earth and is divided into three movements: “Chaos”, “Order” and “Meaning”. Illuminating the night with a stunning pyrotechnics extravaganza, this ending tag to Illuminations: Reflections of Earth offers us the message of “Peace on Earth, Good Will to Men”. This is a fireworks finale not to be missed! “Start the Countdown Clock!” Mickey Mouse leads the way in counting down to the New Year as a captivating array of fireworks surround you in 360 degree glory. Recorded from Disney’s Polynesian Resort as reflections of light dance off of the Seven Seas Lagoon, this awe-inspiring fireworks display features the voices of Mickey, Minnie and Goofy as they ring in 2012! Beginning with the iconic scene of Lady and the Tramp sharing spaghetti in shadow on Cinderella Castle, the romance segment of The Magic, The Memories, and You! has delighted guests young and old. This temporary segment features romantic stained glass scenes of your favorite princesses, including Cinderella and Snow White. The highlight of this seasonal addition is the gorgeous lantern scene from Tangled, creating an emotional moment you’ll remember for years to come! 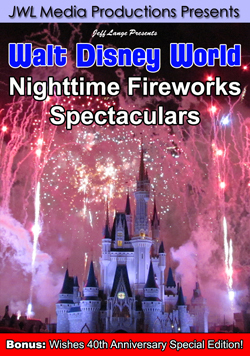 Relive these special Disney memories year after year or experience the magic for the first time by purchasing a copy of “Jeff Lange Presents: Walt Disney World Nighttime Fireworks Spectaculars”. 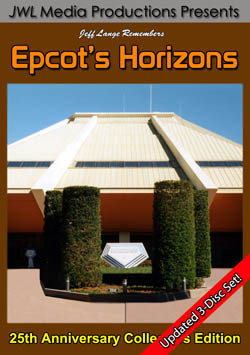 Buy 2 or more titles from my store and receive free shipping with no handling charges. I strive to provide my customers with superior customer service. All orders shipped within 24 business hours guaranteed! 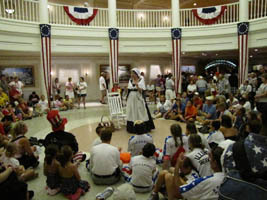 Walt Disney World pulled out all the stops for a fantastic July 4th weekend! 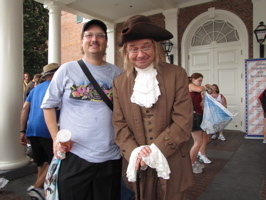 I even was able to meet Ben Franklin at the American Adventure (below, left) and listen as Betsy Ross told us the origins of the American flag (below, right).